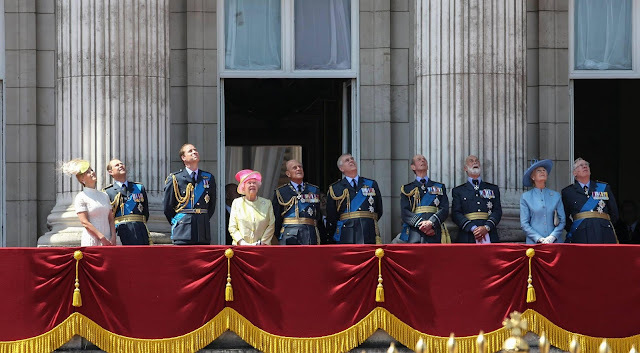 The Queen watched a flypast from the balcony of Buckingham Palace to mark the 75th anniversary of the Battle of Britain. Also present were The Duke of Edinburgh, The Duke of Cambridge, The Duke of York, The Earl and Countess of Wessex, The Duke of Gloucester, The Duke of Kent, Prince Michael of Kent, and Princess Alexandra of Kent. For more: BBC article, Express article, Zimbio gallery. A bright and cheery combo for Her Maj today, made to stand out on that balcony, with her old faithful Jardine Star Brooch at her side. Speaking of old faithfuls, Prince Philip got up to some old faithful tricks of his own at a luncheon later. But before that, it was a refreshing change of uniform pace for the family on the balcony. I do like the sight of all those RAF uniforms all lined up, don't you?